Walt Disney's Carousel of Progress is a rotating theater stage show attraction that is located in Tomorrowland at the Magic Kingdom theme park at the Walt Disney World Resort in Bay Lake, Florida just outside of Orlando, Florida. Created by both Walt Disney and WED Enterprises as the prime feature of the General Electric (GE) Pavilion for the 1964 New York World's Fair, the attraction was moved to Tomorrowland at Disneyland in Anaheim, California as Carousel of Progress, remaining there from 1967 until 1973. It was replaced in Disneyland by America Sings in 1974, and reopened in its present home in the Walt Disney World Resort's Magic Kingdom in 1975. Steeped in both nostalgia and (in the past) futurism, the attraction's premise is an exploration of the joys of living through the advent of electricity and other technological advances during the 20th century via a "typical" American family. To keep it up with the times, the attraction has been updated five times (in 1967, 1975, 1981, 1985, and 1993) and has had two different theme songs, both written by the Sherman Brothers (Disney's Academy Award-winning songwriting team). Various sources say Walt Disney himself proclaimed that the Carousel of Progress was his favorite attraction and that it should never cease operation. This can be somewhat supported by family and friends, who knew of his constant work on the attraction. Of all the attractions he presented at the 1964–1965 New York World's Fair, Disney seemed especially devoted to the Carousel of Progress. The Carousel of Progress holds the record as the longest-running stage show, with the most performances, in the history of American theater. It is one of the oldest attractions in the whole Walt Disney World Resort. It is also the oldest attraction at Walt Disney World to have been touched by Walt Disney himself. Even though the Carousel of Progress does not typically have long queue, there is a preshow video shown to guests while they wait in line. The video talks about the history and development of the attraction, and even includes clips of Walt explaining the attraction on his television show. The video lasts about four minutes, after which guests can usually enter the theater for the next show. On the stage in the loading room is a large Carousel of Progress logo, framed by green curtains and illuminated by color-changing lights. The attraction’s narrator (who also voices John in the rest of the show) tells guests more history about the attraction. He focuses in on the fact that the attraction was Walt's idea, and that he loved the show. After the introduction, the attraction's theme song, "There's a Great Big Beautiful Tomorrow" begins playing as guests move on to the first scene: the scene that takes place during Valentine's Day at the beginning of the 20th century. As the scene opens, robins chirp in the background and the music fades. The father of the family, John, is sitting in a wooden rocking chair inside his home. On his right, his dog Rover is happily lying on the floor. John tells guests that it is "right around the turn of the century" and also that it is Valentine’s Day. He then claims that things could not get any better than they are at that time, before giving a list of the new inventions and technological achievements of the day. These include: buildings being up to 20 stories tall, moving pictures (movies), 8,000 automobiles in the United States, and such technology as gas lamps, telephones, cast-iron stoves, iceboxes, a reservoir which keeps 5 buckets of water warm with three buckets of coal, and a water pump in the kitchen. As John highlights the new pieces of technology, a spotlight shines on them and they begin to work. He then comments that problems such as chopping wood, milk souring, and having to get water from a well are all things of the past. After he is done showing off the new technology, he calls to his wife, Sarah, who is ironing in the room to his left with their young daughter. The two discuss how Thomas Edison is working on an idea for "snap-on electric lights". Sarah then says that will mean "no more kerosene and no more gas." She also shows guests her new "wash-day marvel" and comments that now she can do the laundry in five hours, instead of two days. As John is explaining that Sarah now has time for other things, he is cut off by her response of “Like canning and cleaning the oven?" Sarah then excuses herself, commenting that she needs to get the laundry off the line before it starts raining (which makes Rover bark.) After it begins to rain, the family's son, James, begins to talk from the right room. He is scolded for using his father’s Stereoscope without permission. James is watching Little Egypt dancing the "Hootchie-Cootchie". John comments that she is going to be the star of the upcoming World's Fair, and that James better put the Stereoscope away before his mother finds it. The upcoming World's Fair is a reference to the 1904 World's Fair in St. Louis, which has led many to conclude that the scene guests are watching takes place on Valentine’s Day 1904 (although this is unconfirmed). As John and James finish talking, John tells guests that they also have "one of those new talking machines". The left stage then shows the family’s grandmother, sleeping with the phonograph on. The radio plays "There's a Great Big Beautiful Tomorrow", and the grandmother’s parrot exclaims "She keeps that thing going all day long!" John's attention is then drawn to a room on the right, where his daughter Patricia is. Patricia is getting ready to go to a Valentine’s Day dance on the other side of town. John explains that she will be taking one of the new "horseless trolleys", before telling her that she better be home by 9 o'clock. He then tells guests that he is going to take one of the said trolleys downtown to have a root beer (which he explains is just a sarsaparilla with a new name). After he is finished, he begins singing "There's A Great Big Beautiful Tomorrow" and the Carousel spins, moving guests to the next scene, set during Independence Day in the "Roaring Twenties". People can travel by train from New York to California in 3 days. John then tells guests that Thomas Edison has brought electricity to his home. At this point all of the electronic machines in the kitchen, including a refrigerator, a toaster oven and other cookware, turn on. John warns the appliances not to blow a fuse, but they do. This not only shuts out the power in the family's house, but the whole neighborhood loses power as well. One of the neighbors can be heard telling her husband that "They did it again!" and that she wants her husband to go over and confront John (but this never happens). John then tells Jimmy, his son, to go put in a new fuse. Jimmy remarks that his father blows a fuse every time he has company over, before the lights come back on. With the power in the house restored, the scene shifts to the mother who is sitting on the front porch. She is outside sewing a George Washington costume for John to wear. John then tells the guests that Sarah's Ladies Club is in charge of the town’s 4 July celebration and that the whole family will be performing in their presentation (with John and Sarah going as George and Martha Washington). As John begins making a joke that being the "father of our country suits me", Sarah interrupts him to say how happy she is that they put electric lights on the porch. John then tries to make another joke about going to the 4th of July next year as Benedict Arnold, when Sarah interrupts him again to say how excited she is about her firework show. As she is talking, Rover begins barking and John tells him not to interrupt while Sarah is interrupting. Sarah then tells John that Jimmy has volunteered to pick the music for the celebration. Jimmy then appears with his grandfather in one of the left rooms, dressed in a colonial outfit and standing next to a radio, which is playing patriotic music. John taps his foot to the music, tells Jimmy that it's a nice tune and then tells guests that they can now get news and entertainment on their radio from all over the country (even Pittsburgh!) The radio then says that people have begun gathering downtown for the 4th of July. After hearing this, John tells his daughter Patricia that she better hurry up and get ready. Patricia is sitting in a room on the right, wearing a Statue of Liberty costume. She tells her father that she hopes her new boyfriend doesn't see her in it and run away. John makes another joke, saying she can "always carry that torch" for him. He then tells guests that the family now has indoor plumbing which is great for cold days, especially for Uncle Orville, their constant house guest. Orville is then shown sitting in a bathtub on the left side of the stage. John informs guests that he has set up an air cooling system. While Orville sits in the bathtub, a fan sits in front of a block of ice, blowing on him. As John tells guests that Orville has no job, Orville responds by saying "No privacy at all around this place". At this point, Sarah calls John and tells him it’s time to go. John concludes the scene by telling guests that with all the conveniences they have, they are really on easy street. He then begins to sing "There's A Great Big Beautiful Tomorrow", as guests move on to the next scene, set in the "Fabulous Forties" during Halloween. John is now sitting in a circular booth and wearing a sweater. His dog Rover has once again changed colors but is still lying on the floor. As the music stops, John tells guests that everything is better than ever in the 1940s. He then shows off the new technology that they have in the kitchen, including a refrigerator that holds more food and ice cubes, and an automatic dishwasher. John also informs guests that he is now a part of the "rat race," which he then explains means that the highways are now full of people who drive to work in the city, and then turn around and drive home every day. John also says that they now have television (when it works) and that John Cameron Swayze brings them the news every night. At this point, the scene shifts and focuses on a room on the right, where the grandmother and grandfather are watching wrestling on TV. After that, Jim (the son) calls from his room and asks what John thinks of his Jack-O-Lantern. After John says it’s scary, Jim remarks that he used his sister Patty as a model. After Rover "laughs" at this joke (barks), Sarah calls out from a room on the left and tells Jim and Rover that Patty is prettier than either one of them. John then tells guests that Patty is using an old exercise machine that was "all the rage in the twenties" but never worked. Patty is then shown using the machine while talking on the phone about her date for that night. After this, John tells the audience that he is caught up in the "do-it-yourself" craze. John and Sarah are redoing their basement and making it into a rumpus room. On the left, guests can see Sarah putting wallpaper up in the rumpus room. She is using a "paint mixer" that John says he made for her, using a food mixer. As he is admiring his handiwork, the paint mixer goes haywire and shoots paint everywhere. John then says that it's time to move on, but everybody should try and cheer Sarah up by "singing our song". At this cue, "There's A Great Big Beautiful Tomorrow" begins playing and guests move onto the next scene, set in the present during Christmas. Unlike previous scenes, the Christmas scene begins with the whole family in one room. They all sing "There's A Great Big Beautiful Tomorrow" as guests enter the scene. John is standing on the right working on Christmas dinner, while Sarah sits nearby working on a computer. Rover is once again in the kitchen, and is, once again, a different color. Jim and his grandmother are playing a virtual reality game, while Trish and her grandfather sit around the Christmas tree. Sarah tells John that she has programmed the oven to recognize his voice. John then comments that now all of the household items are voice-automated, to which the grandfather replies "Great... tell the refrigerator to bring me a root beer." Sarah responds to the joke, saying that although they can't do that, she can brighten the tree lights. She then tells John to try the voice-activated oven, which he does with no problem. After the oven confirms John’s temperature command, Trish comments that "it (the oven) even talks back!" She and the rest of the family also make fun of John for burning last year’s turkey. At this point, the grandma who has been playing the virtual reality game has her score up to 550 points. John and Jim are both impressed, and they repeat the score in awe. Upon hearing John say 550, the oven increases its temperature, although nobody seems to notice. The grandfather then remarks that he cannot believe the new gadgets that people have today. Trish, cutting him off, begs him not to tell another story about the time before they even had car phones! The grandfather, still undeterred, tells her that for a while he didn't even have a house phone, not to mention the technology of today. He then gives examples of modern technology including laser discs (Laserdiscs were discontinued technology and were superseded by DVDs and Blu-ray and Ultra HD Blu-ray) and high-def TV's, before commenting on how everything is automated today. His last example is about automated plumbing (which causes a flushing noise be heard in the background). This leads Uncle Orville (who is off-stage) to once again remark "No privacy at all around this place". The scene then shifts back to the grandmother who has now beat her video game. She finishes with a score of 975, which John once again repeats. After hearing this number, the oven overheats and begins to smoke. The family all laughs at the fact that another Christmas turkey has been ruined. John jokes that maybe in the new century, ovens will learn to read minds. Jim says "Don't worry dad, someday everything will be so automated that you won't ever ever have to cook another Christmas turkey again." At the prospect of this, Rover barks, leading the family to laugh and sing "There's A Great Big Beautiful Tomorrow" one final time. Guests then come to the unloading area, which looks identical to the loading area. As guests ride into the theater, a pop-style version of the theme is sung as a duet. After the song, guests are thanked for seeing the show and told to collect their belongings before exiting. In the late 1950s, after Disneyland Park's initial success, Walt Disney planned to expand the Main Street, U.S.A. area with two districts: "International Street" and "Edison Square". In Edison Square, guests would be treated to a show which was supposed to be called "Harnessing the Lighting" hosted by an "electro-mechanical" man named "Wilbur K. Watt". The show would chronicle the evolution of electricity in the home, from the late 19th century to the present and beyond — showing how much electrical appliances, specifically GE appliances, have benefited American life. After each time period, or "act", was over, the audience would get up and walk to the next one, but this idea was eventually scrapped. However, the Main Street expansion idea fell by the wayside. One of the reasons for this was that the technology available to put on the show just was not up to par with what Walt Disney wanted. The idea, however, stayed in Disney's mind for the next few years. GE still wanted to work with Disney, but a better outlet was needed. General Electric approached Walt Disney to develop a show for the company's pavilion at the 1964–1965 New York World's Fair. Disney leapt at the chance to rekindle his relationship with GE, who would fund the project and the new technology necessary to bring it to life. Reaching back to the Edison Square concept, Walt Disney again pitched the idea of an electrical progress show to General Electric executives and this time they loved it. During the planning phase, Disney's Imagineers perfected the Audio-Animatronics (AA) technology necessary to operate the "performers" in the show. They were not the most advanced, but it was enough to get the show running. The technology used in Walt Disney's Enchanted Tiki Room and another attraction designed by Disney at the 1964–1965 New York World's Fair, Great Moments with Mr. Lincoln, made the Carousel of Progress possible. Besides the AA performers, the Imagineers (led by Disney engineers Roger E. Broggie and Bob Gurr) also devised a "carousel theater", so that the audience could stay seated and ride around a stationary set of stages, instead of getting up and walking from stage to stage. This technology allowed the audience to remain comfortably in place during scene changes and avoided the time-consuming disruption of changing seats repeatedly during a show. Singing cowboy Rex Allen was tapped to voice Father, the host and narrator of the show that replaced the original "Wilbur K. Watt" character. Allen later commented that he did not know exactly what he was getting into. Walt Disney asked Disney songwriters Richard M. Sherman and Robert B. Sherman to create a song that could serve as a bridge between the "acts" in the show. Walt explained to the brothers what the show was about, and they wrote a song with his enthusiasm in mind. The song was titled "There's a Great Big Beautiful Tomorrow". The Shermans later stated that they believe that the song was Walt's "theme song," because he was so optimistic and excited about the future and technology itself. The show opened at the Fair as Progressland. It was one of the most-visited pavilions at the Fair. One of the unique features that made the attraction so popular was that a circle of six theaters (all connected by divider walls) revolved clockwise around six fixed stages every four minutes. There were identical load and unload theaters with a dazzling wall of light, the "Kaleidophonic Screen", and the "performers" appeared in the 1890s, 1920s, 1940s, and 1960s — literally a "Carousel of Progress"! Though more than 200 people entered and exited the attraction every four minutes, it was not uncommon to wait over an hour in line. For the 1965 season of the Fair, a massive covered queue was constructed next to the General Electric Pavilion on an empty lot to protect visitors from New York's hot summer sun. At the end of the Carousel show, fairgoers were invited to walk up to the second floor of the pavilion and see the General Electric "Skydome Spectacular". The Skydome Spectacular projected images of nature and energy into the domed roof of the GE pavilion, similar to a planetarium. The show demonstrated the many ways that GE was harnessing electricity and the power of the sun for the benefit of its customers. At the end of the Spectacular, in the first demonstration of controlled thermonuclear fusion to be witnessed by a large general audience, a magnetic field squeezed a plasma of deuterium gas for a few millionths of a second at a temperature of 20 million degrees Fahrenheit. There was a vivid flash and a loud report as atoms collided, creating free energy (evidenced on instruments). The temperature listed in the 1964 guidebook was 20 million degrees F; in the 1965 guide the temperature was up to 50 million degrees F.
The Carousel of Progress was re-opened at Disneyland Park on July 2, 1967, and this version and the "New York World's Fair" version had only little differences. The new home for the ride took nearly seven months after Walt's death, as part of the New Tomorrowland. Due to the success of the attractions Disney created for the Fair, General Electric agreed to sponsor the Carousel of Progress at Disneyland. However, the Carousel of Progress was to be a permanent fixture at Disneyland, and it is unknown how many years General Electric would have sponsored the ride had it stayed there (presumably, 10–12 years, as many other sponsors throughout Disneyland Park have historically done). The actual attraction was located on ground level, and a new nearly identical theater system was constructed. The sets and "performers" all came right from the Fair itself and remained nearly original. There were some slight changes: a new voice was recorded for Mother, "Christmas in the Home of the 1960s" was slightly updated in set design and technology, all references to General Electric's passé "Medallion Home" campaign were dropped, and Father from "The Home of the 1940s" now sat on a bar stool, rather than on the kitchen nook bench. After the show, guests boarded a speedramp that would take them to the second level of the building. On the upper level, a 4-minute post show, narrated by Mother and Father, with a few barks and growls from their dog, coincided with guests gazing at an enormous model of Progress City. Progress City was based on Walt Disney's original concept for Experimental Prototype Community of Tomorrow (EPCOT) and the Walt Disney World property. As the 1970s rolled in, the Carousel of Progress saw dwindling audiences. GE thought they were not getting the most for their advertising dollars, surmising that 80% of the people that saw the attraction were Californians, and had seen the attraction many times. GE asked Disney to move the show to their new Magic Kingdom at Walt Disney World. The Disneyland show closed on September 9, 1973 and was packed up for Florida. The Progress City model was disassembled, but only portions of the center of it were re-assembled in Florida. These can be viewed from the People Mover as it travels through Stitch's Great Escape. Disneyland soon incorporated The Carousel Theater into its plans to celebrate America's Bicentennial. The theater was filled with a new show in 1974 called America Sings, a salute to American music. That show closed in 1988, not to be replaced for ten years. Innoventions, a version of the popular Epcot attraction of the same name, opened with the New Tomorrowland in 1998, using a stylized rendition of "There's a Great Big Beautiful Tomorrow" as its theme song. The building was then redesigned and reopened in 2015 as the Tomorrowland Expo Center, hosting the Star Wars Launch Bay. Carousel of Progress was one of two attractions that opened in the Magic Kingdom's Tomorrowland on January 15, 1975; the other attraction being Space Mountain. General Electric signed a 10-year contract to sponsor Carousel of Progress at the Magic Kingdom in Walt Disney World. Unlike the small changes that had occurred when the Carousel of Progress moved from the 1964–1965 New York World's Fair to Disneyland Park, extensive changes were made when the attraction moved to Walt Disney World. A new carousel theater building was designed to house the attraction: a one-story pavilion, with a loft above. The loft is used by the Tomorrowland Transit Authority PeopleMover track, wrapping around the north side of the building. The interior and exterior of the building received new color schemes with blue and white stripes that grew smaller and larger as the building turned. Also, the theaters now rotated counterclockwise, rather than clockwise like the two former theater systems. The load and unload theaters no longer featured the stunning "Kaleidophonic Screens" that had dazzled guests as they boarded and exited their respective theater due to constantly needing maintenance. The old screens had stretched from one wall to the other, with the giant GE logo in the center. They lit up in various colors and patterns like a kaleidoscope as the orchestral version of "There's a Great Big Beautiful Tomorrow" played. Various problems plagued the screens after 1973, so a set of silver generic curtains with the GE logo in the center took their place in both the load and unload theaters with different colored lights shining on them. The Florida version was planned with no post-show. Guests would load and unload on the first floor. The Progress City/EPCOT model was significantly sized down so it could fit in a window display that could be seen from the Tomorrowland Transit Authority. This display is located on the left hand side of the TTA track inside the north show building housing Stitch's Great Escape!. Because of the changing times, a new theme song, written by the Sherman Brothers, was created for the Florida show. GE asked the Shermans to write a new song because they did not want their customers to wait for a "great big beautiful tomorrow;" GE wanted them to buy appliances today, so a song titled "The Best Time Of Your Life," (sometimes erroneously called "Now is the Time") was created. Although the song was still very peppy and positive, the Shermans still felt that "There's a Great Big Beautiful Tomorrow" was a better fit. A new cast of voices and "performers" were showcased in the 1975 version, including actor Andrew Duggan as Father. The first three "acts" had some cosmetic and set design changes. The finale was changed to "New Year's Eve in the Home of the 1970s," and the dog also changed breed. In 1981, the finale was updated to showcase "New Year's Eve in the Home of the 1980s." A new script was written for this scene change, but the rest of the show remained the same. The attraction closed briefly so that the changes could be implemented. On March 10, 1985, General Electric's contract expired, and it chose not to renew. The attraction closed shortly thereafter so that all General Electric references could be excluded from the attraction. The GE logo was replaced with a logo that showed a blueprint of the six carousel theaters surrounding the six fixed stages on the signs outside of the attraction and the silver GE curtain was kept but a round sign with the blueprint logo and the name Carousel of Progress hid the GE logo. The GE logo still exists on several household appliances throughout the attraction, like the refrigerator in Act 3, which features the GE logo and the words, "General Electric" on it. This is one of the remaining logos that can still be seen today. On August 16, 1993, the attraction closed, and many blueprints at the time showed a new "Flying Saucers' ride inside the show building, but this idea never came to be due to being over-budget it was decided to just update the Carousel of Progress. To better reflect the theme of the New Tomorrowland: "The Future that Never Was." Gears and other mechanical symbols were being prominently featured in the other pavilions in the New Tomorrowland, so the Carousel of Progress was redesigned to feature them. The attraction and show were renamed Walt Disney's Carousel of Progress. A giant cog sign in the load and unload theaters that says "Walt Disney's Carousel of Progress" replaced the blueprint sign. The final scene was updated to "Christmas in the House of 2000" (as envisioned in 1993). A new cast was hired for the narration recordings, with American writer, raconteur, and radio personality Jean Shepherd as the voice of the father (Shepherd also does a pre-show narration about the history behind the attraction). Additionally, Rex Allen, the voice of the father at the original Disneyland attraction, plays the Grandfather in Act 4 of the show. For the first time, names of some of the characters in the attraction were revealed. A 4-minute pre-show about the creation of the attraction was played on monitors while guests waited in line. A contemporary version of "There's a Great Big Beautiful Tomorrow" returned as the attraction's theme song. The attraction reopened on November 23, 1993 and was the first updated attraction for the New Tomorrowland, which was unveiled in phases. Since then, the attraction has undergone many slight mechanical and cosmetic changes. Because of a decrease in attendance following the September 11, 2001 attacks, Walt Disney's Carousel of Progress closed in October 2001. It was reopened soon afterwards on a seasonal basis, causing fans to become concerned for the attraction's future. Although numerous "permanent closure" rumors still plague the attraction, Disney has consistently said that there are no plans for permanent closure or any closure at all. For various reasons, the attraction has had some minor refurbishments in recent years. Though it is still listed as a seasonal attraction, it has remained open nearly every day of the year and during the Magic Kingdom's regular park hours since 2003. As of 2016[update], the gears-and-cogs paint scheme is being replaced by futuristic "strikes" of various different colors. The attraction's name is now painted on the rotating part of the building. The show draws much of its inspiration from industrial films that American appliance manufacturers funded to demonstrate how their products would change the pattern of domestic chores and improve life. The desire to sell during the Great Depression and the rural electrification projects of the New Deal were two of the motivating forces behind these films. Also, there are the remnants of an exhibition from the 1933 Century of Progress exposition in the Chicago Museum of Science and Industry that feature four typical rooms of Chicago houses in various decades prior to the exhibition. America Sings, the audio-animatronic attraction that replaced the Carousel of Progress at Disneyland, used the same rotating theater building, with the outer ring of six theaters, connected by divider walls, revolving mechanically around the six fixed stages in the center of the building. The attraction operated between 1974 and 1988. Like the Carousel of Progress, the first and the last scenes of America Sings involved the loading and unloading of guests, while the other four scenes, or "acts," depicted a particular era. America Sings rotated in a counter-clockwise direction, rather than the original clockwise direction. From October 1, 1983, until January 9, 1999, an attraction known as Horizons existed at Epcot in the Walt Disney World Resort. It was more or less a sequel to the Carousel of Progress, depicting the host family living and working in technologically enhanced environments in the near future. During the first portion of its run, the show was also sponsored by General Electric (1983–1994). In the attraction, there was a scene where a robot was "working" in the kitchen, making quite a mess, among other things. In the background, the song "There's a Great Big Beautiful Tomorrow" could be heard. In 2009, Space Mountain featured several tributes to Horizons in its post-show. Also in 1983, Meet the World, at Tokyo Disneyland, was an attraction that was housed in a rotating theater. It featured both audio-animatronics and video, looking at thousands of years of Japanese history. It closed in 2002. Innoventions (1998–2015), a later occupant of the building formerly used for the Carousel of Progress and then America Sings at Disneyland, depicted a few images from the older attraction on its colorful exterior murals, and the attraction's Audio-Animatronic host Tom Morrow (voiced by Nathan Lane) sang an updated version of "There's a Great Big Beautiful Tomorrow". Banners hung from the building depicted the Carousel of Progress and other past attractions. Inside, the ASIMO show featured a stage set reminiscent of the "contemporary" scene in the Carousel of Progress, including a view of the Community of Tomorrow through the set's picture window. The ASIMO exit music is the original Rex Allen recording from the Carousel of Progress at Disneyland. The building's rotating platform used for Carousel of Progress, America Sings, and Innoventions stopped spinning in later years, and by the time of the opening of the building's latest tenant, Star Wars Launch Bay in November 2015, the mechanics used to rotate the lower level appear to have been removed altogether. The entire soundtrack for the Disneyland version (1967–1973) can be heard on A Musical History of Disneyland (2005). The soundtrack was also released as part of the 5-disc CD set Walt Disney and the 1964 World's Fair released on March 24, 2009 which includes instrumental versions of "There's a Great Big Beautiful Tomorrow" representing different eras of progress, and an early "Alternate Universe" version of the complete show. The complete 1975 "Now is the Time" version was found on Walt Disney World Forever. The current (1994) theme song of the show, "There's A Great Big Beautiful Tomorrow", was previously available on the 2008 "Four Parks – One World: Walt Disney World" album and is currently available on the two-disc "Walt Disney World Resort Official Album" from 2013, along with other hard-to-find songs from the Walt Disney World parks. Mike Judge's 2006 film Idiocracy features the "Time Masheen", a poorly maintained amusement park ride which presents apocryphal American history in a format similar to the Carousel. In the film Iron Man 2, Tony Stark promotes the "Stark Expo", a fictional version of the World's Fair. The original Carousel of Progress building can be seen on the map of the Stark Expo 2010 website as the Kodak Pavilion. The Ford Magic Skyway pavilion can also be seen nearby, north of the Fountain of Planets, incorporated as the Royal Purple Synthetic Oil Pavilion. In addition, Richard Sherman wrote the Stark Expo's theme song, "Make Way for Tomorrow Today." The ride plays a central role in Cory Doctorow's 2011 novella The Great Big Beautiful Tomorrow where the ride is preserved by the protagonist in a post-apocalyptic wasteland. The game Epic Mickey features the ride as part of the land called Tomorrow City. In the 2015 Walt Disney film Tomorrowland during the opening scene showing the New York City World's Fair the song "There's a Great Big Beautiful Tomorrow" can be heard. In the 2019 live-action version of 1941's animated Dumbo, (set in 1919) includes a scene where characters are visiting an amusement park's Carousel of Progress-type attraction featuring 1930s/1940's-style "futuristic" applicances. ^ a b Sullivan, Bob. "50 years ago, the World's Fair promised a life of leisure. We're still waiting". boingboing.net/. Boing Boing. Archived from the original on June 9, 2014. Retrieved June 22, 2014. ^ "Walt Disney's Carousel of Progress". disneyworld.disney.go.com. Walt Disney World. Archived from the original on September 18, 2015. ^ a b Imagineers, The (September 1, 2005). The Imagineering Field Guide to the Magic Kingdom at Walt Disney World. Disney Editions. p. 121. ISBN 0-7868-5553-3. ^ Glover, Erin. "Star Wars Enhancements, New Experiences Coming Soon to Walt Disney World and Disneyland Resorts". 15 August 2015. The Disney Parks Blog. Retrieved August 16, 2015. ^ Sherman, Robert B., Walt's Time: from before to beyond, 1998, p 168. ^ Lafferty, Mike (November 24, 1993). "Around The Worlds". Orlando Sentinel. Archived from the original on March 29, 2015. ^ "The Carousel of Progress". CarouselOfProgress.com. Archived from the original on December 9, 2002. Retrieved March 24, 2007. ^ "Walt Disney World Official Album - Various Artists". ^ "Walt Disney World Official Album". iTunes. Archived from the original on January 3, 2014. ^ "Stark Expo 2010 : Better Living Through Technology". Archived from the original on May 4, 2015. ^ "Iron Man 2 (2010)". IMDb. Archived from the original on April 2, 2012. ^ Raets, Stefan (November 1, 2011). "Progress or Change? Cory Doctorow's The Great Big Beautiful Tomorrow". tor.com. Holtzbrinck Publishers, LLC. Archived from the original on January 10, 2014. Retrieved January 10, 2014. ^ Doctorow, Cory (October 20, 2011). "The Great Big Beautiful Tomorrow html version". craphound.com. Cory Doctorow. Archived from the original on March 8, 2013. Retrieved January 10, 2014. 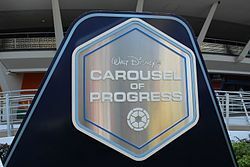 Wikimedia Commons has media related to Carousel of Progress.